Bush Radio is Africa’s oldest community radio station project based in Cape Town, South Africa and is said to be the mother of all community radio stations. Bush Radio was officially formed in 1992 after two years of community consultations of all aspects of the radio station. After repeatedly applying for a broadcast license to the apartheid government in 1992, Bush Radio then decided to broadcast illegally on the 1 st of May 1993. After the illegal broadcast, the apartheid government confiscated the transmitter and other equipment that belonged to Bush radio. It did not end there; they arrested and charged the Chairperson of the Board, Mervyn Swarts, and the Co-ordinator, Edric Gorfinkel to the full extent of the law. 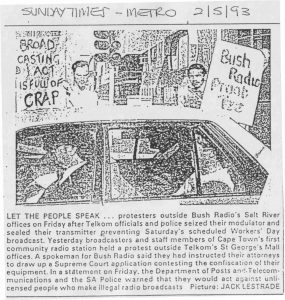 Bush Radio members and volunteers then organised placard demonstrations calling for the dropping of all charges, as well as the establishment of an “independent authority” to regulate broadcasting in South Africa. After a year of court hearings, the apartheid government dropped the case. After the first democratic elections in 1994, Bush radio received a temporary broadcasting licensing in 1995. During that time they were sharing the frequency with another radio station, they broadcasted 12 hours a day while the other radio station broadcasted the other 12 hours. Bush Radio was issued with a four-year permanent community radio license in July 2002 and another four-year license in 2006. Since then, Bush Radio has been broadcasting for 24-hours a day, seven days a week. Bush Radio is now involved in community development. We have scholarship programmes that are given to underprivileged children and we have upliftment programmes to develop our community.